Need to learn how to wrap your head around Git, but don’t need a lot of hand holding? Grab this book if you’re new to Git, not to the world of programming. Git tasks displayed on two-page spreads provide all the context you need, without the extra fluff. With two years of experience with Git, I thought I would have known most everything in Pragmatic Guide to Git. After reading it cover to cover, I learned that’s not the case. It’s a well-organized collection of useful Git techniques for all audiences. This book is a must-have for anyone using Git or just getting started with Git. It has saved me time in finding the best practices for managing my Git repositories and will sit on my bookshelf as the go-to resource for anything Git. Git can be intimidating and frustrating to new users. Pragmatic Guide to Git alleviates that pain with a straightforward, concise walk-through that arms readers with exactly what they need to use Git productively. I’d heard a lot of the hype surrounding Git. It wasn’t until I read Travis’ book that I learned why people are so enthusiastic about it. Travis does a great job explaining the power of Git in a digestible format. Save $11.00 on the combo pack. Get up to speed on Git right now with Pragmatic Guide to Git. Here you’ll find the 95 percent of Git that you’ll use at least once a week, as well as a few tasks that will come in handy but aren’t used as often. Task-oriented two-page spreads get you up and running with minimal fuss. 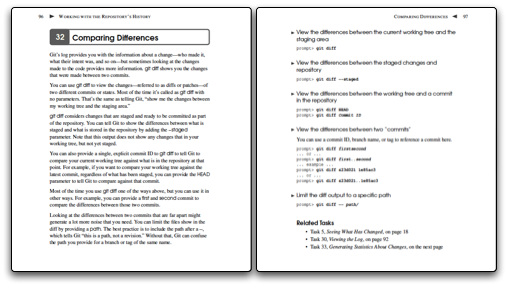 Each left-hand page dives into the underlying implementation for each task. The right-hand page contains commands that focus on the task at hand, and cross references to other tasks that are related. You’ll find what you need fast. Git is rapidly becoming the de-facto standard for the open source community. Its excellent merging capabilities, coupled with its speed and relative ease of use, make it an indispensable tool for any developer. New Git users will learn the basic tasks needed to work with Git every day, including working with remote repositories, dealing with branches and tags, exploring the history, and fixing problems when things go wrong. If you’re already familiar with Git, this book will be your go-to reference for Git commands and best practices. You won’t find a more practical approach to learning Git than Pragmatic Guide to Git. Travis Swicegood is a professional programmer; owner of Domain51, a web and mobile development company in Lawrence, Kansas; and the author of Pragmatic Version Control Using Git, the first published book on Git. He’s passionate about open source development and is active in communities across several languages.